More Often we’re asked by our customers that what type or style of window shutters would perfectly suit their interior décor and functional requirements. The main reason why our clients are usually confused while making a purchase decision of Plantation Shutters because there is so much to choose from that too differentiated with style and functionality. Unlike blinds and curtains, Shutters have the power to preserve the uniqueness of the space it covers without completely hiding it and this can be done by installing customized shutters just the right fit for the area in concern. 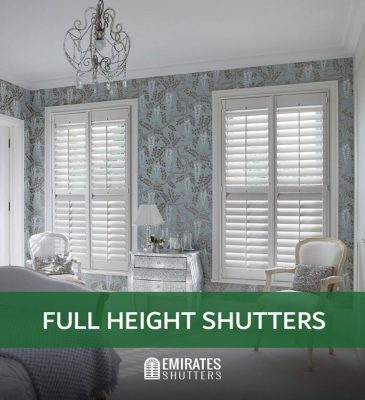 With reference to Emirates Shutters’ previous customer encounters the trend seems to be going towards the Full Height Shutters, this is mainly because they are absolutely sophisticated with a touch of versatility. But we cannot afford to ignore the chic elegance of more conventional styles for interior window shutters for example Café Style Shutters, Tier on Tier Shutters and Track System Shutters. Besides the, Solid and Specialty Shaped Shutters are also in demand. Solid Shutters as the name advocates are solid in texture and creates an aura of European Décor whereas Specialty Shaped Shutters are specifically designed for windows at unusual positions and of exclusive shapes. Full Height Shutters are one of the most best-selling styles of plantation shutters because of their iconic and extremely elegant appeal. Their robust design makes them compatible with almost any kind of window. It is proven that they will blend in with any interior décor and in any living space of your home because of their minimalistic nature. Full Height Shutters are mostly installed in taller windows requiring complete revamping and styling. These Shutters are designed in such a way that the top and bottom louvers of the panel can be operated separately, this done by using a solid horizontal dividing rail known as Mid rail. With the help of a Mid Rail, Full Height Shutters can be controlled for ultimate privacy and light control. 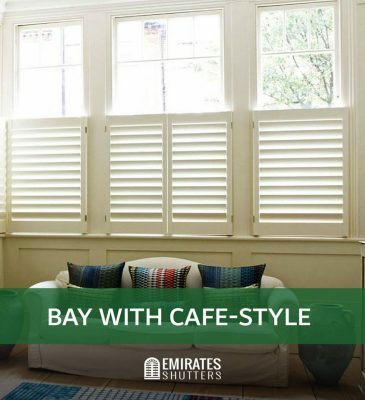 Café Style Shutters are unique when it comes to their aesthetic appeal because they only cover bottom half of your window, they maximize light whilst maintain privacy. They are highly functional because there is always an option of rotating the slats to control light filtering. Based on our previous experience with our customers, we’ve noticed that people with street facing windows usually prefer installing Café Style Shutters and not just that this specific shutter style is also an ideal solution for first floor windows preventing your home to be directly overlooked by outside people. Major similarity between Full height Shutter and Tier on Tier is that they both cover the whole height of the windows, but what sets them different is the fact that Tier on Tier shutters like the same suggests are divided into top tier and bottom tier that are completely separated at a certain point of the window. So basically, this basic feature allows you to either completely close both the Tiers or you might want to open the top one to maximize light and close the bottom one to ensure privacy. If we talk about our experience with customers who opted for this kind of shutter style, we can assure that most them had an amazing view through their windows and they wanted to make the most of it. 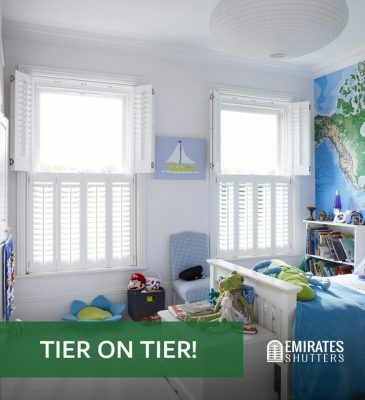 So, if you are also lucky enough to have a view worth enjoying through your windows, Tier on Tier could be the perfect choice which would allow you to celebrate the scenery through your windows and filter light or ensure privacy according to your requirement. Flexibility at its best, separation of the panels. Perfect option for ground floor rooms and those bay windows. More hygienic option as compared to curtains and blinds. Track system, shutters are specifically designed for homes and windows where a long run of shutters is required. Their popularity is mainly for their functionality to be used as a room separates, patio or French door cover and even for walk-in wardrobes. Track systems are also known as sliding shutters and are amazing at providing a breathtaking panoramic view to any window. Not just that they are extremely versatile when it comes to filtering external light into the living space, for instance, if you require complete black out you can pull out the louvers closed, you can get partial light if you open the louvers, and with the sliding option just fold away the shutter for letting the light completely in. 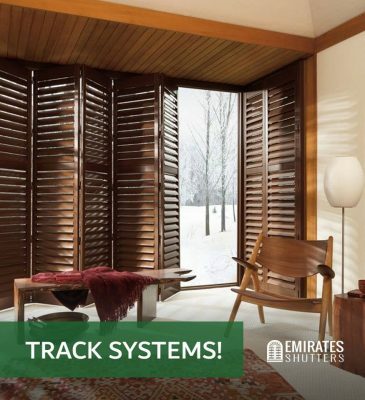 Since the tracked system shutters are mainly used for large and wide windows or glass doors, they are replacing drapes and long train of curtains because when compared these shutters look extremely classy, chic and sophisticated. They provide insulation and style all in one! Solid shutters are a more traditional style of window dressing and they deliver a completely different look for your windows and they cover the entire windows in solid form. Solid shutters always come with a paint finish and there is also an option of finishes that customers can choose from therefore you can either keep things plain and or decorative according to your style preferences. Homeowners who prefer a window dressing that looks fabulous, ensures privacy and is convenient to operate and look after usually opt for solid plantation shutters. If we talk about interior decorating, we’ve encountered customers with period homes opting for solid shutters mainly because these shutters when installed give the home a Victorian touch keeping the décor extremely historic and traditional. Apart from being a great asset to the interior décor, Solid shutters are also very functional when it comes to shutting the noise out for which other types of window dressings are completely useless and increased security because these solid shutters when installed act as an extra barrier between your home and the external world. One of the most impressive installations we provide is of specialty shaped shutters that are customized according to the windows shape, size, angle and position. There are times when our teams must opt for risky measures for the installation due to the location of the window. It doesn’t really matter if your windows are arched or of unusual shape, shutter installation can bring out the best features of your windows especially when the shutters are custom-made according to that window. The way we manufacture our specialty shaped shutters for our customers it does not only add a beautiful finish to that window but also, they are highly functional and would ensure privacy and practicality to that space. We hope our blog was insightful enough and gave you enough information to make up your mind for the windows of your home. 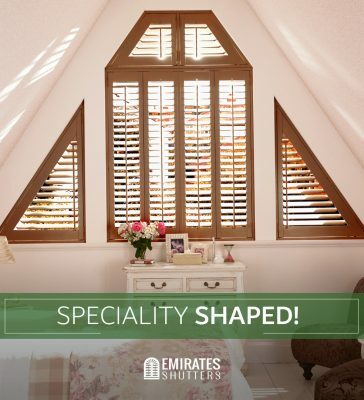 So, if you have a window that requires to be re-styled by one of our plantation shutters, the best thing to do is book a free home visit with our experts team, because all our products are custom built which is why our team will visit you at your convenience, take the measurements of the windows and doors in concern, carry out a sample demonstration and would assist you in making an informed purchase decision.